Sue Walker has given to the world of art a rich, detailed and intimate account of teh history of teh Victorian Tapestry Workshop (VTW). This publication invites you into the creative and often physically demanding process of large-scale Tapestry production. The book begins by setting the mood of the Australian art world from the mid 1950's and discusses tapestries by Australian artists woven in overseas workshops. In 1970 to 1971 an exhibition of 17th and 18th century French tapestries was held at the National Gallery of Victoria. Lady Delacombe, wife of the then State Govenor Sir Rohan Delacombe, felt passionately that Australia could produce its own tapestries, by Australian artists, using high quality fine australian wool. 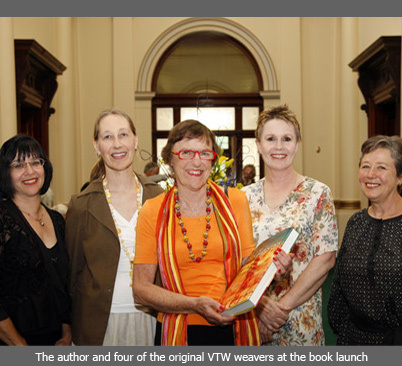 A highly enlightened group of enthusiastic supporters began to form, including Dame Elisabeth Murdoch who, as this book documents, has become a most generous patron to teh Victorian Tapestry Workshop from its beginnings to the present day. ... which makes this publication a rare and valuable resource for any tapestry weaver.